Even before 1500 AD, people in North America celebrated a winter religious festival when the days stopped getting shorter and began to get longer again. 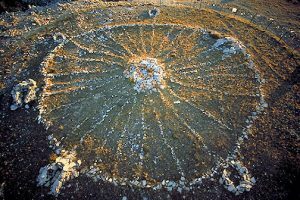 Many people built stone structures to make it easier to know when the solstice had arrived. When European settlers arrived, they brought with them some new ideas about a winter holiday. Gradually these ideas mixed together. Then new ideas got added to that, to create what we know as Christmas. Some of the first settlers, the Puritans, didn’t believe in celebrating Christmas at all. That’s because the way Europeans celebrated Christmas was wild. It was a lot like the way we celebrate New Years’ Eve or Mardi Gras today. Young people got drunk and set off firecrackers and shot guns. Sometimes they went to rich people’s houses and demanded gifts of food or money. Puritans didn’t think that was a good idea! Other early settlers, at Jamestown, did hold parties to celebrate the birth of the baby Jesus. They ate mincemeat pies, and young people got drunk. When did Santa Claus come into it? Dutch settlers, in New York about 1800 AD, had Sinterklaas visit each house on Saint Nicholas Eve, December 5th. People hung up their socks. Then Sinterklaas (our Santa Claus) rode to their house in a flying wagon and put presents in their socks. How did African-Americans celebrate Christmas? In the South, Christmas was the only holiday African-American people usually got from their slavery. They, too, celebrated with drinking and costumes and parties. When did Christmas trees get going? In the 1800s, as more settlers arrived in the United States from different places, they brought their Christmas traditions with them. German immigrants brought the idea of having a live Christmas tree inside the house, with candles on it. Why were German immigrants coming? Why is Christmas a family holiday now? But most of the solid traditions of Christmas in the United States come from two pieces of writing from the mid 1800s: Clement Clark Moore’s Night before Christmas poem (1823) and Charles Dickens’ A Christmas Carol (1843). Christmas got another boost in 1868, when Louisa May Alcott used the holiday as the beginning of Little Women. As more and more poor people were working in factories and living together in cities instead of on farms, public Christmas parties got scarier for rich people. It was Moore’s idea to have Santa Claus come to children. Then people would stay home with their families on Christmas and not go out drinking. Dickens showed how people could still give to the poor, but without the wild parties. Who put Santa Claus at the North Pole? 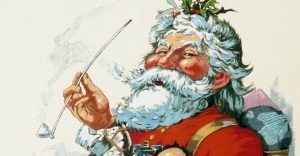 During the Civil War, in 1863, Thomas Nast drew the first picture of Santa Claus looking like we see him today. Nast also thought up the idea that Santa Claus lived at the North Pole and had elves. In the 1870s, soon after Thanksgiving, Christmas became a national holiday. It caught on fast. Who brought Nativity scenes to America? 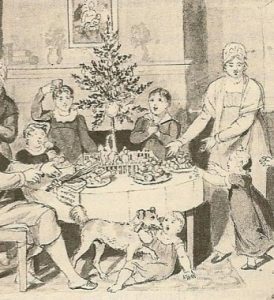 By the end of the 1800s, Christmas in the United States was so firmly established that the traditions of later arrivals, like people from Italy and Russia, had a much smaller effect on the way Americans celebrate Christmas. Nativity scenes, however, came to America with Italian Catholic immigrants. Still, some of these later-arriving traditions did become part of American Christmas. Many Italian-Americans and Irish-Americans have a fish dinner Christmas Eve, with seven or so different fish courses. Many Italian-American and Irish-American people also go to midnight mass. Seems like a shame about the Christmas partying though? Today, Christmas itself is a family holiday for most people, but the old traditions of partying, drinking, costumes, firecrackers, and guns still go on a week later on New Years’ Eve. Cite this page: Carr, K.E. Christmas – American holiday. Quatr.us Study Guides, August 14, 2017. Web. April 20, 2019.